The singer was performing his solo slot on the reunited group's tour in Cardiff when disaster struck and his costume proved not to be Strong enough. 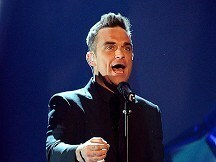 Robbie told the sell-out crowd at the city's Millennium Stadium: "I'm so excited, I split my kecks." TV screens on the stage then focused on the split, which occurred during his opening number Let Me Entertain You. Robbie - who has played to hundreds of thousands of fans with the group since kicking off the tour last month - asked the cheering fans to post videos of his crotch on his website. And he talked of abandoning his slot after the mishap, but decided to carry on singing with his tattered trousers. But then he pulled them off completely after he finished singing his breakthrough solo song Angels. The chart star returned with a fresh pair of pants when he and the group joined forces to perform number one single The Flood during the show. Robbie, 37, is not the first star to rip their trousers while performing on stage. The chart career of US singer PJ Proby has been overshadowed by his infamous hipster-splitting appearances as he played concerts in 1965. Jessica Simpson has also recalled how her leather trousers once gave way while she performed at New York's Madison Square Garden when she was not wearing underwear.